Abject Gallery invites you to join us for “Monochrome Coloured Autophobia”, our second solo exhibition by painter, sculpture and installation artist Jaisen Yates. Yates has returned from China after a successful show at the prestigious Museum of Modern Art in Hubei, Wuhan and will be working once again in residence at Abject Gallery in preparation for his up and coming exhibition tour of China and Europe which begins later this year in Beijing. Yates’ work epitomises a lifelong obsession with the unique; his accumulations of objects and images share strong senses of meaning and hold the intrinsic essence of the time of their production. The meanings extracted from these sources are both the personal and the subjective endeavour of the viewer, an arrangement of artefacts that spiral off, illustrative of an evolving memory. 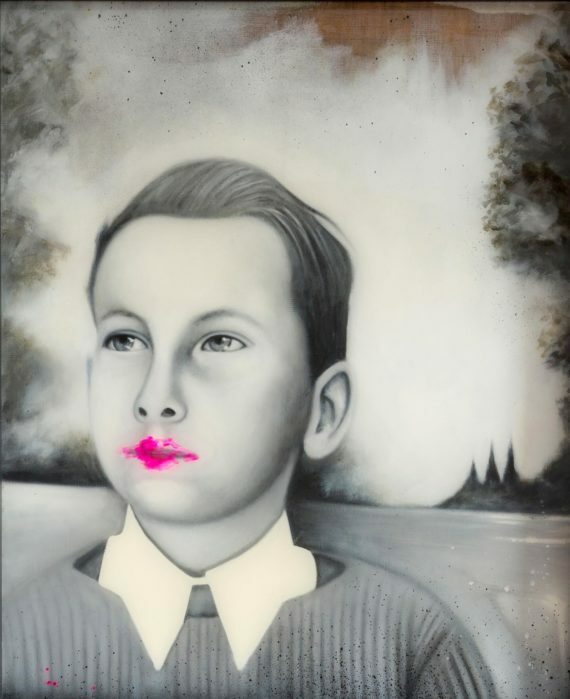 These works are many faceted: magical realism combined with a street-art aesthetic, a surrealist undercurrent in its association of disparate elements creating an appeal of subconscious memory. Found objects become connected to others by an esoteric relationship dependent on their occurrences in time, semi-cultural affiliations and historical relevance; a transition of transcendental information. These works are an echo of surrealism, a search for context – historical, emotional and aesthetic – they form a personal lexicon, giving Yates a sense of ownership of the world he explores. For Yates painting and sculpture are often a struggle between the planned and the accidental, a place of freedom where imagination cannot be stopped. Through the process of painting, the direction of work can unexpectedly begin to change, in this transition something else manifests, thus forming a new vocabulary. Mixing form and content, a carnivorous approach reflects life’s worth of looking and listening. Yates is a creator of objects and images, his wish being that these forms are granted the freedom to become themselves.